It is well known that the magnetospheric response to the solar wind is nonlinear. Information theoretical tools such as mutual information, transfer entropy, and cumulant-based analysis are able to characterize the nonlinearities in the system. Using cumulant-based cost, we show that nonlinear significance of Dst peaks at 3-12 h lags that can be attributed to VBs, which also exhibits similar behavior. However, the nonlinear significance that peaks at lags 25, 50, and 90 h can be attributed to internal dynamics, which may be related to the relaxation of the ring current. These peaks are absent in the linear and nonlinear self-significance of VBs. 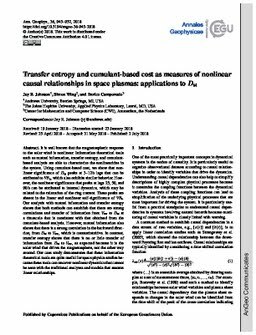 Our analysis with mutual information and transfer entropy shows that both methods can establish that there are strong correlations and transfer of information from Vsw to Dst at a timescale that is consistent with that obtained from the cumulant-based analysis. However, mutual information also shows that there is a strong correlation in the backward direction, from Dst to Vsw, which is counterintuitive. In contrast, transfer entropy shows that there is no or little transfer of information from Dst to Vsw, as expected because it is the solar wind that drives the magnetosphere, not the other way around. Our case study demonstrates that these information theoretical tools are quite useful for space physics studies because these tools can uncover nonlinear dynamics that cannot be seen with the traditional analyses and models that assume linear relationships.